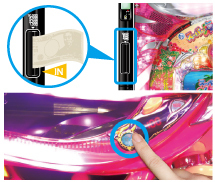 After selecting a machine,deposit money into the "buy balls" machine, which is usually located on the left side of the game machine. Press the "ball rental" button of the gaming table. Grasp the handle and turn it to the right to shoot the ball.To shoot the ball with more force,turn the handle further to the right. When shooting the ball,the targets are the pegs(known as "Bukkomi") located all a round. Please put the ball into the pocket (referred to as the "start checker"),located in the bottom center of the game machine. When the ball goes in,the pictures in the center will spin around and change. If you match up,it is easy for you to have a chance to hit the jackpot.When you have hit the jackpot, the pocket located at the bottom of the game machine(referred to as the "attacker")will pen up.Please continue to put in more balls after the machine indicates that no more balls will come out. 3.When you are hitting the jackpot. When you hit the jackpot,balls will continue to come out,so please store the balls in the counting machine located below the game machine. Please press the "return" button of the gaming table.Please pull out the card that came out. Please submit to the prize counter desk if you have balls. Prize exchange and balance settlement is valid one day if purchase.Usage depends on the shop.Please ask staff. You can split the money or split the ball in some shops. If you have a membership card,you can save your balls and use it when it came next balls you had saved.